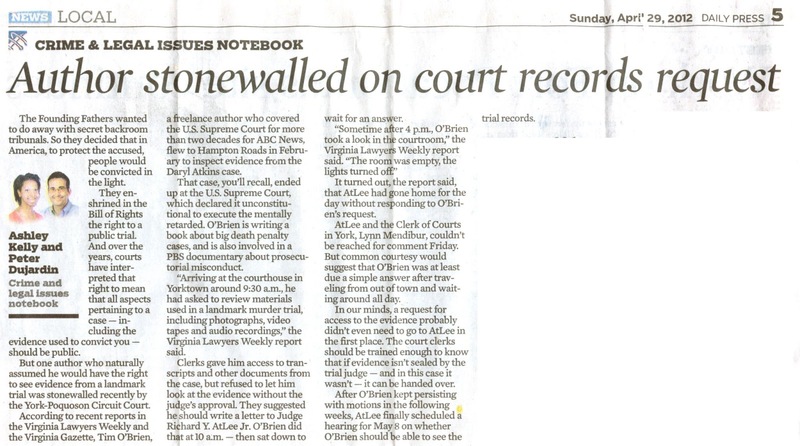 Gloucester VA Links and News: Gloucester Officials Ignore Freedom Of Information Requests. 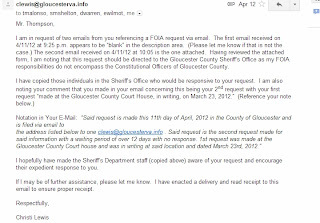 Gloucester Officials Ignore Freedom Of Information Requests. Since March of this year, 2012, we have been filing with Gloucester County, requests for information under the Freedom Of Information Act. To date, we are being ignored and are now on our third request for the same information. The information being sought regards a search warrant that was issued in Gloucester County back during the month of May of 2010. 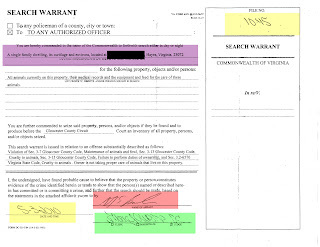 Here is a jpg image of the search warrant as given to the defendant. 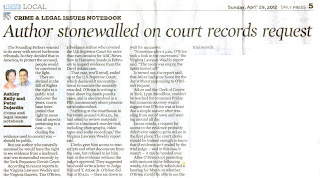 What is also interesting is that the Daily Press on Sunday, April 29th did a story on an Author Stonewalled On Court Records Request in the Crime and Legal Issues Notebook section of the paper. This story is reprinted here under the fair use doctrine. To be 100% fair. Our first request was in writing at the Gloucester County courthouse with the Gloucester County clerks office. We requested the affiant affidavit because the defendants state they never received this with the copy of the search warrant. If this is true, the search warrant was invalid and the search is considered an illegal raid. Please see VA Code Ann 19.2-56 below. Also requested was any and all calendar schedules for and or showing any scheduling of the search on the search warrant in question. The written request was for a search warrant File Number 10.45. I knew that the search warrant file number was not valid but this is what Gloucester County had written in the File Number section of the search warrant. I wanted a letter showing that this file number was invalid. By the way, I had to hand write the request and was not given the usual form for this request. The filing of this request was witnessed. On the date this request was filed, one of the clerks who only had a couple of minutes to look up information before leaving told me that there were 3 pages of affiant information and two affiant's. I already knew this but was not sharing that part of the information. I was later told that the county had 10 days to respond to this request and asked how I wanted it sent. I requested that the information be sent via US mail. After 5 days of the written request, I did get a phone call from the Gloucester County clerks office where this request was made. I have a time and date stamped recording of the phone call along with the message that was left. The message was to call the clerks office and the phone number to the clerks office. I wanted a letter so I did not call back. After 14 days had passed, allowing for extra days for mail delivery, I had no response on this request at all other than that one phone call. 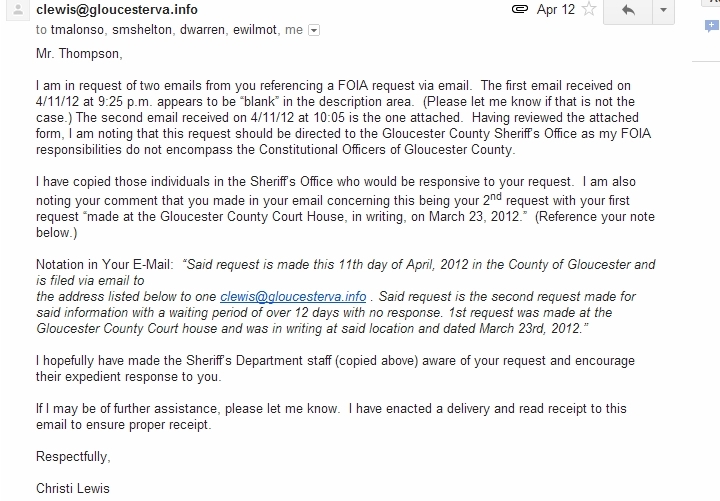 So then I went on line and filed the FOIA (Freedom Of Information Act) form at the Gloucester County web site. The form if filled out on line will not retain the information typed in there for the requested information. It boots that part out. So I had to create my own form using theirs. I sent it via email that gives a digital time and date stamp, to the person listed as the main contact for these forms. Christi Lewis is the Gloucester County contact person. I filed this pretty late at night and it was received and responded to on April , 2012. Here is a jpg of the email I received. .
And Who Received This Copy? Here is a copy of the form I sent requesting said information. FOIA, please provide the following information to help us assist you. Mailing Address: Removed for privacy. date of creation, time of creation and by whom created and in what office for said search warrant. Gloucester County Court house and was in writing at said location and dated March 23rd, 2012. As of today, May 1st, 2012, I have now filed a 3rd request for this same information. This is a third request for the above information and is dated May 1st, 2012. To date all requests have been ignored. The second request was given 12 days for a response along with extra days for last minute mailings. In other words, I gave Gloucester County the benefit of the doubt. This was not ignored by one party in Gloucester County, but instead it has been ignored by multiple parties in Gloucester County as evidenced by Christi Lewis' email to me on who she sent my requests to. One has to assume at this point that maybe there is something to hide here? In upcoming stories on this case, we will show that there is in fact a lot to hide, in our opinion. We have a lot of questions and now we are producing a lot more questions and so should you. 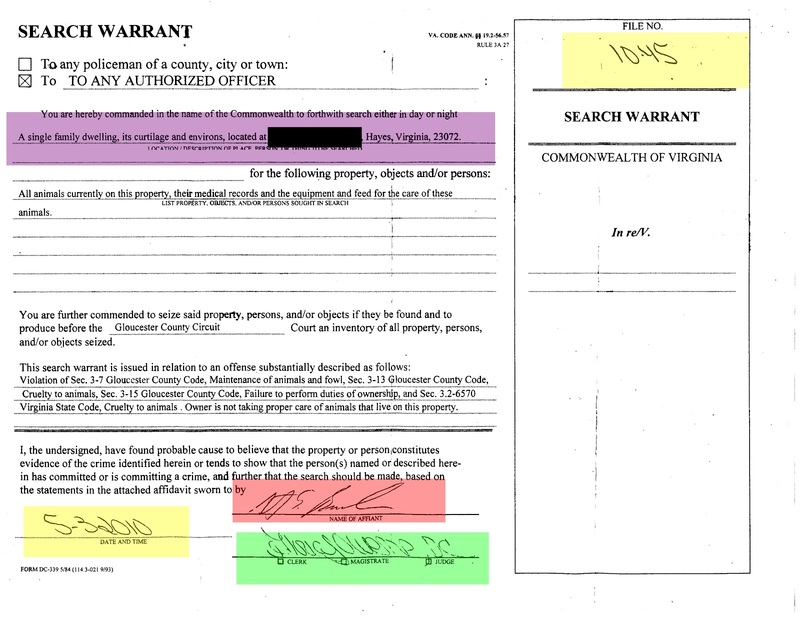 Our next article is going to deal with the actual search warrant itself and we are going to go over the Virginia laws as it applies to search warrants and in particular this search warrant. We think you will agree with our opinion that the search warrant issued was totally false, misleading and illegal. See our story, Gloucester County Producing False And Illegal Search Warrants? Evidence That 911 Dispatcher Lied In Court? Gloucester County Forged 911 Call?